“HEY APATHY! 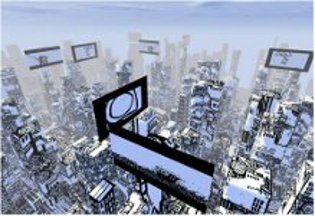 Video Game Art Virtual Metropolis” is an interactive video installation. The work combines ink drawings, stop motion animation, contemporary classical music and cutting edge video game technology creating a surreal expression of life in the metropolis. The imagery explores thematic landscapes designed to emphasize the interrelationships between commercial culture, factory production, war and the natural environment. Through the combined efforts of artist Mike Parsons, programmer Michael Peters and the musical group Tor-Q the work investigates a visual language and conceptual themes generally associated with fine art while subverting the video game platform primarily reserved for mass consumption. 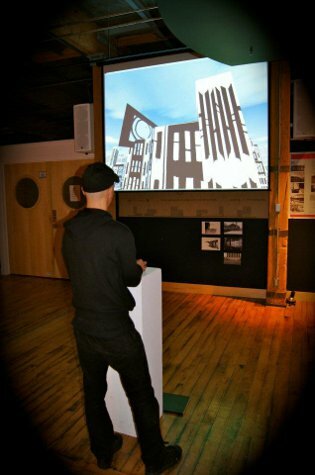 The work was projected on a large video screen complete with interactive controls during the 2011 Built for Art festivities at 401 Richmond Street. Read more about our 3d Art installation here. Built or ART is an annual event at 401 Richmond that brings forth artists from the building and its community. Every year these artists have new and inspired projects to share, which should be no surprise as the people who work and pass through 401 daily are constantly engaged in the creation and exchange of new ideas. Like 401 Richmond, a heritage building dedicated to adaptive reuse and supporting the arts, Built for ART follows the same principles. This year’s adaptations of the building’s spaces include the front lobby as an interactive performance space, the courtyard as an outdoor cinema, the side loading dock as a portrait studio, the back loading dock as a gallery on wheels, the Urbanspace Gallery as a dance studio and interactive game site, the basement lobby as a collective’s painting studio, and the 4th floor freight elevator lobby as home to an interactive bench. 401’s talented tenants will also be presenting special projects in their studios, shops, and galleries including all night musical performances, projections, and exhibitions. Built for ART and the community it reflects is a good indicator of the current preoccupations of artists practicing in our metropolis. This year artists are creating projects that engage with technology, interactivity, immediacy, and hybridity, as seen in projects by Mike Parsons and TORQ, Candida Girling and Aaron Davis, and Gallery 44 Members. These are elements of daily life and their interaction demonstrates the flux of human existence: ever reaching for the new and ever returning to the known. The bench, the 3d art, video game, the superhero tours, the vintage films, the bicycle art, photo, video, contemporary art: it all comes together sinuously under one roof, because it is inspired under one roof. And when that inspiration can and does come together, in one space, at one time, it creates magic and perhaps myth – only time and we will tell.